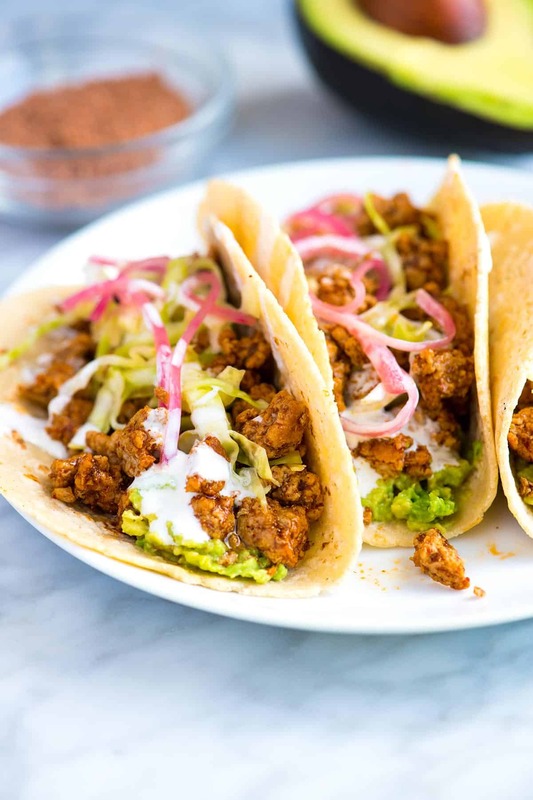 Thanks to ground pork, these easy pork tacos come together fast. 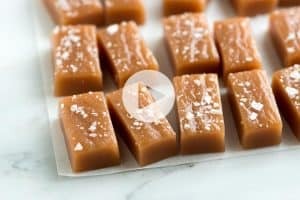 You can even make the filling in advance. Jump to the Crave-Worthy Ground Pork Tacos Recipe or read on to see our tips for making it. It’s no secret that we love tacos around here. We’ve made them with shrimp, beef, roasted veggies and most recently, shredded chicken. Even though we’ve shared a bunch of taco recipes with you, we’ve always missed pork! Well, thanks to these crave-worthy tacos, that’s been remedied and you know what, they just might be my current favorite. These pork tacos are FAST and very easy to make. The taco filling can be made and safely stored up to three to four days in advance. They are adaptable to your favorite taco seasonings. I love using our homemade blend, but you can easily swap that out for your favorite store-bought blends. You can add just about anything to the top of the tacos, I’ve shared my favorite pork taco toppings below. Ground pork or bulk sausage (chorizo sausage would be amazing, we all use chorizo to make chorizo scrambled eggs). Oil or butter for cooking the ground pork. Taco seasoning makes them taste amazing. I use our homemade blend, but you can use store-bought seasonings. Tortillas and your favortie taco toppings. As I mentioned above, I love using my own seasoning blend for these tacos. You can use store-bought, but I highly recommend our blend. It’s so much more flavorful, easy to make, and can be stored for months in your spice cabinet. You could stop there and the tacos will be absolutely delicious (promise). If however, you want to really knock these pork tacos out of the park, add mushroom powder. I know that mushroom powder sounds odd, but trust me, it adds a savory, meaty flavor to the party. Mushrooms naturally add umami. Which is why we include the mushroom powder in our blend. It makes it taste incredible. You can read all about it in our taco seasoning recipe — we even share how to make it. 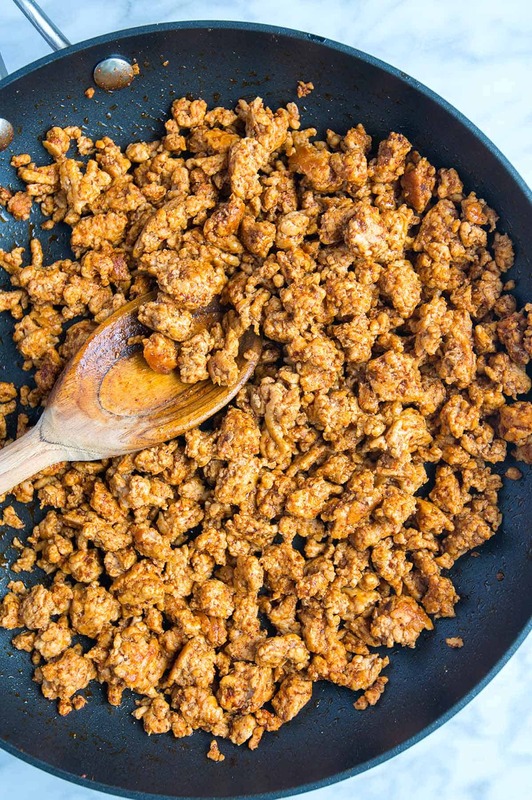 Brown the ground pork in a skillet with oil or butter. Stir in taco seasoning and broth (or use water). 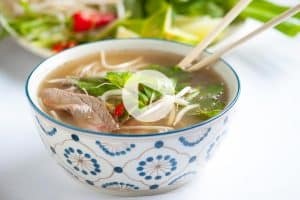 Cook until the pork is cooked through and the broth reduces and coats the pork. Serve in warm tortillas with your preferred toppings (I’ve shared mine below). I love a layer of mashed avocado in my tacos and when I have it in the fridge, a spoonful of homemade guacamole is amazing. To add some creaminess, try thinned out sour cream. I mix sour cream with a small squeeze of lime. For a dairy-free option, try our vegan dreamy tahini sauce. I love adding zesty pickled onions to tacos. They take an hour to make, but last in the fridge for a couple of weeks (I add them to everything). 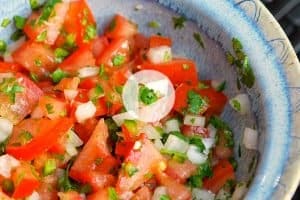 Salsas are always welcome, try our roasted tomatillo salsa or for a fresh salsa, try this pico de gallo. Shredded cabbage or a simple cabbage slaw like this cilantro lime coleslaw would be amazing. Shredded Chicken Tacos with tender chicken and a bright and creamy cilantro sauce(the sauce is so good). Chile Butter Shrimp Tacos with chile butter shrimp, mashed avocado and a quick and crunchy slaw. Shredded Beef Tacos (made in the slow cooker) the beef for these tacos literally falls apart, it is irresistible. Roasted Veggie Tacos featuring roasted spiced vegetables, black beans, and a creamy cilantro sauce (100% vegetarian, 100% delicious). 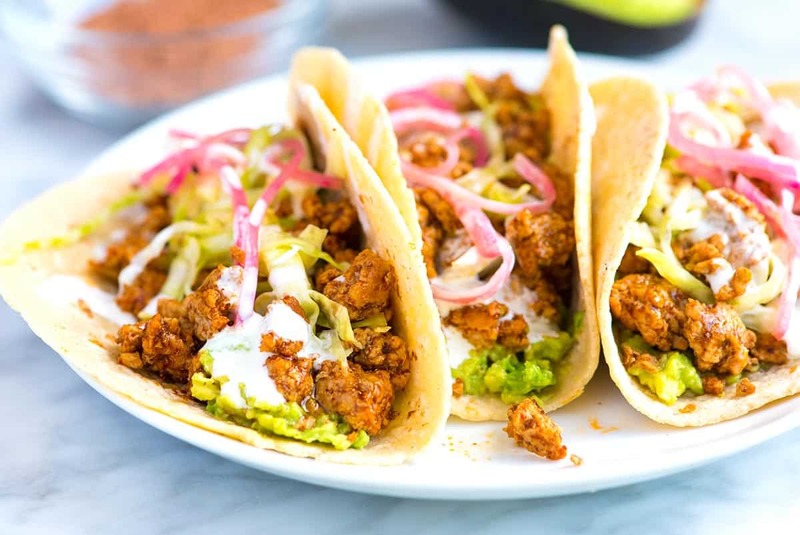 Thanks to ground pork, these easy pork tacos come together fast. We highly recommend making your own taco seasoning with chili powder, cumin, smoked paprika, coriander and cayenne pepper. If you’re using store-bought taco mix, watch out for adding additional salt. Often the store-bought packages already have salt added so you might not need to add any additional salt. Heat a wide skillet over medium heat then add the oil. When the oil is hot, press the pork down into the pan, spreading it out as thin as you can so that it browns evenly on one side, about 5 minutes. When it begins to brown on one side, use a wooden spoon to break the pork up into small crumbles. Continue to cook until browned on all sides, about 3 minutes. Toss 1 tablespoon of the taco seasoning with the pork. Taste a small crumble to see if it needs more seasoning and adjust from there — when using our homemade taco seasoning mix, we use 2 tablespoons. Stir in the water and let it come to a simmer. The mixture will thicken and coat the pork. Season with a pinch or two of salt (if you are using packaged seasoning, it may already have salt added). Wrap tortillas, in two stacks, with aluminum foil. Place into the oven for 10 to 15 minutes, or until heated through. Fill each warmed tortilla with pork and your favorite toppings. 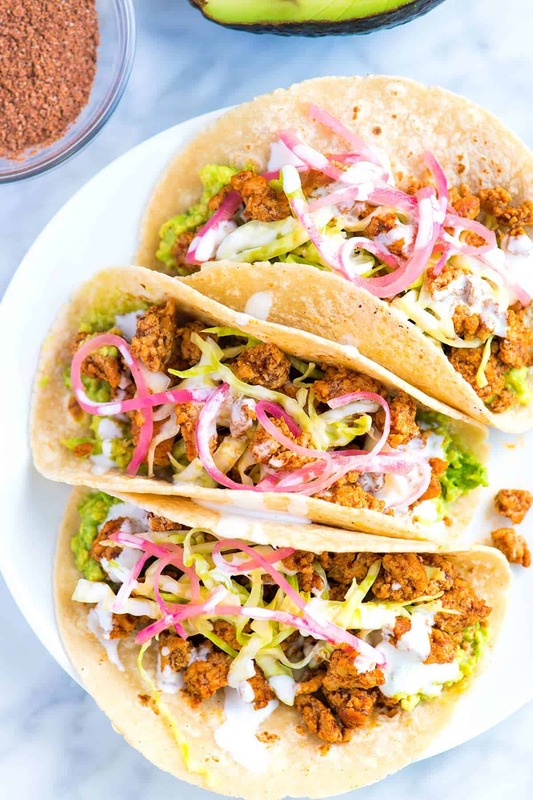 We particularly love these with mashed avocado spread onto the bottom of each tortilla then topped with pork, cabbage, pickled onions and sour cream. Cabbage: Raw shredded cabbage is a great option, but for more flavor, try our Mayo-Free Cilantro Lime Coleslaw. Salting the cabbage before adding the dressing keeps this coleslaw salad crunchy and brings out so much more flavor than without. The dressing is simple — lime, honey and olive oil. Making thinned sour cream: So it can be drizzled, stir 2 tablespoons of sour cream with a teaspoon or two of water (or lime juice). Make-ahead: The pork can be made up to 4 days in advance when stored in an airtight container in the refrigerator. Reheat the pork before serving — you may find adding a tablespoon or two of additional water helps to moisten the pork. Nutrition Facts: The nutrition facts provided below are estimates. We have used the USDA database to calculate approximate values. We included 1 avocado, 1 cup of cabbage, 2 tablespoons of sour cream, and corn tortillas in the calculations. The ground pork calculated was about 20% fat. Choosing a leaner option — such as ground tenderloin — would reduce the fat and calories. Forgot to add, I used your taco seasoning and will never purchase store bought taco seasoning again. Made these today with the pickled onions and the Mayo-Free Cilantro Lime Coleslaw, all I can say is WOW! These are now a new staple in our house. Will be making every month at least twice if not three times lol. Thank you! Love these! Made the taco seasoning with the porcini powder. Browned the meat and drained, added dice onion (but will make pickled onion for next week), chopped black olive and 1 Tbsp tomato paste (borrowed from my Mom’s recipe). Muy sabrosa! I love any and all tacos! 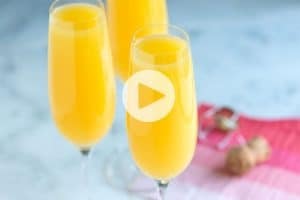 These are super easy and look delicious!